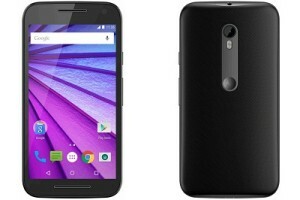 Home » Articles » Moto G 2015 (3rd Gen) Review! Moto G 2015 (3rd Gen) Review! First time – it can be an accident, second one – it can be a coincidence, but when you deliver on of the best selling smartphones for three years in a row, it’s probably something more than luck. So, did Motorola made a good job with the third generation Moto G? Here’s my take. First off, the display. Like its two predecessors, the Moto G 2015 sports a 720p IPS display. It’s slightly bigger at 5″, so technically a little less crisp, but man this thing is beautiful. I know, you pixel-maniacs like me are probably going to argue with this, but many times it’s more than just pixels. It’s bright, it’s vivid, it has excellent viewing angles, and it offers a pretty wide range as for brightness. Whites are bright and clear, and blacks are reasonably deep for an LCD display. You can see pixels if you look close enough, but at reasonable distance you’ve got a clear image overall. While this is no Galaxy S6, you honestly can’t ask for more at this price point, and it’s probably the best display around under 1080p. However such an enjoyable display would probably lose lots of points if not paired with good audio: while on one hand is somewhat disappointing having lost the double front facing speaker from the previous Moto G, the one that we’ve got left is really good. It is loud enough, and certainly more than most speakers out there, and the sole fact of being front facing is really welcome. Is this the perfect media consumption machine? Probably not, but it’s more than enough for gaming and for some basic movie watching. While build quality in the previous Moto Gs was certainly not a strong point, Motorola took the right path here. The sturdy surrounding band, the rugged back and the waterproof construction are some really welcome additions, and the tack-tile buttons on the sides are also first-timers in the Moto G series. Keep in mind that while it totally looks like metal, the band around the sides is just really hard plastic. As for the appearance itself, you can immediately tell this is a Moto device: the design language is the same found on its bigger brother, and apart from a couple of details this really is a little Moto X. Of course, you’ve still got that lovely little dimple on the back, which is handy to rest your finger on while using the phone. Thinness is not on the list of qualities of the Moto G, though: it’s quite thick and heavy for a 2015 phone, but probably in the best way. The solid band and the rounded back make for a more “substantial” feeling, and if a thicker phone means a bigger battery, I’m taking that. When it comes to grip, the materials choice makes it really easy to hold, also thanks to its relatively small footprint. It also looks pretty solid, and I guess it could easily handle a couple of drops with no problem. While it was the Moto X that lead the way of great performers at low specs, the Moto G came right along: for the third year, Motorola proved they still know how to do it. The Snapdragon 410 powering the Moto G is accompanied by either 1 or 2 gigs of RAM, depending on the storage option you go for, and it both cases it behaves really well. Opening apps and games is quick, and you’ve got a buttery smooth multitasking. Of course the slower CPU does slow down loading times a bit – compared to a modern flagship -, but lag and stutter are nowhere to be seen. Browsing, social medias and texting are easy tasks for a phone like this, and most games run with zero fuss too. However if you’re interested specifically in the gaming department, be sure to hit that subscribe button and stay tuned in the upcoming days for some more thorough gaming tests on the Moto G. While Motorola mostly delivered a stock version of Android, they made sure not to forget the homemade Moto features. Most of the utilities from the Moto X made their way to the Moto G: you’ll be able to use tools like Moto Display and Moto Assist, or the gestures for the flashlight and the camera. Moto Display is honestly one favorite of mine: just raise the phone to get a peek of the latest notifications, or easily interact with them with a couple of taps. If you really have to complain about something in this phone, that is the camera: while the sensor’s resolution is the same as the iPhone 6S, this is no flagship when it comes to pictures taken. They’re pretty sharp, as you would expect at 13 megapixels, but the dynamic range and the contrast are definitely not thrilling. If you just need a shooter to share pictures on the web, this will do, but if you plan to do some more advanced photography, I’d look elsewhere. The camera interface is not my favorite too: Motorola did everything possible to make it simple and intuitive, but in it forgot some important stuff throughout the way. Probably the most annoying thing with the camera app is that it forgets your settings every time you open it, and that is a huge time-waster for me. On the positive side, it does shoot FullHD video and it also sports a nice SloMo mode at 720p. Finally, the battery life. To make it clear, the battery life on this thing is probably the best one in any smartphone right now, or at least among the top 3. You can count on 6 or even 7 hours of screen on time, depending on your usage, and you can easily pull out 4 hours of screen time with really heavy usage. Combine the slightly bigger battery, the reliable processor and the close-to-stock version of Android, and you can see where that comes from. So, at the end of the day, the Moto G is an incredibly complete package for the price, from the display to the performances to the battery life, and if you’re still unsure whether this is the phone for you, it is, trust me. But what about you guys: do you think Motorola made a good job? Definitely share your opinion with us in the comments below.